At the end of December I took you on a frosty walk around our garden. This month I plan another walk around the garden but this time going in the reverse direction taking in the different views as we progress around. The old kitchen garden divides the garden making circular walks the best way to see the whole garden. This is the view you get as you enter the garden through a gate in the garden wall. The lovely tulips are Tulip Ballerina. The urn is designed to be a focal point as you enter. In fact when the plants have grown up in the summer the view of the garden is restricted making an element of surprise as you walk in. From this point, with the urn on our right, we can see diagonally across to the steps which provide access to the higher level lawn. The Tulip Red Impression is continuing to create a good display. As we move further into the garden it begins to open up. In the distance you can just see small lake which used to be the fish ponds for the rectory that was next door. Further still on the paved area we get a different view down the garden past the tree that got damaged recently in a storm. Behind us is the back door of our house with a number of climbing roses on the walls. This one is Rosa Old Blush China. Actually it is not meant to be a climber but if it wants to climb I happy with that. Next to Rosa Old Blush China is Rosa Madame Alfred Carriere. These two roses are both flowering very early this year. Going up the steps on to the higher lawn we get to the spot where my classic End of Month View is taken. (See January, March, October, September, August)The tulips are continuing to put on a display and the aliums are just beginning to open up. The blossom on the apple tree is out and looking good despite the storm damage. Behind us is an area, beneath some large lime trees, which we treat as a woodland garden. We have made some cobble paths here to enable easy access. A seat provides an interesting viewing place across the garden. Continuing on around the garden we can see the end of the garden wall on the right. In the circular bed as well as the Brunnera Mr. Morse, Tulip Hageri Splendens is now in flower. We have now come round to the bottom right hand corner of the garden and are looking up behind the garden wall. The planting here is mainly shrubs designed for relatively easy maintenance. Continuing on and just before the first yew hedge there is a small pond on the left. This pond has been designed to be very nature friendly with a sloping edges enabling easy access to the water and an easy escape route should something fall in! Having walked along behind the wall we get to a small grass lawn and flower bed. The Geranium himalayense has just started to flower and looks great with the tulips. The bed is called Ivy’s bed after the lady that lives in the cottage over looking the border. Across the lawn we get to the Italianate area. Twenty years ago this was all paddock and we added the pond and landscaping. As I mentioned, in 2016 the pond developed a leak and a major repair job was done. With this disruption we decided to renovate the whole area. The gravel borders were contained with wooden edging and this had rotted away. These are being replaced with metal edging and the gravel, into which the garden had been growing, is all being cleaned up! The obelisks each have had a rose planted in their centre to grow up with clematis. Work has yet to be done on the joints between the paviours which need cleaning and re-pointing. The seat by the pond is one of our ‘gin & tonic’ seats and this is the view from there. With all the work on the pond it is going to take a year to stabilise. The little green house at the end of this area is even fuller and there will soon be standing room only! Looking back at the ‘gin & tonic’ seat the Carpinus betulus Frans Fontaine columns are just coming into leaf. Having completed the tour we get to the shady border by the end of the house with Erythronium Pagoda, various hostas and ferns providing the main planting. 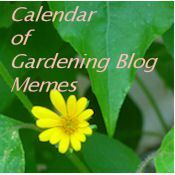 Do have a look at Helen The Patient Gardener’s blog where you will find links to other gardens at the end of April. Thank you to Helen for hosting this meme. Thanks. I guess the lawn would be hard to keep in Singapore! Yes it would be. Firstly we are land scarce and properties are high rise or with small gardens. We do have estates but few and far between as these belong to the top bigwigs here. But we do have a heritage UNESCO Botanical Gardend and Istana where our President of Singapore “resides”. Hi Steve, your garden is simply stunning! I love the big urn, such a show stopper! Your tulips are all very pretty and add such nice pops of color to the garden. I just admire the fact how well maintained your garden is. It is a feast for the eye! Your high input really pays dividends your garden is simply beautiful. I like how the different areas flow into each other. I have R. Old Blush. Mine is always the first to flower here and is one of the few roses to actually thrive. Thanks, hard work but a lot of fun. Looks lovely, Steve! So much to enjoy – but your columnar hornbeam, Frans Fontaine, are particularly stunning and very well placed. What a glorious ambiance your whole garden has, and you have enhanced it with your plantings (the white lily-flowered tulips in the shrub border – a joy to see)! Just the right touch there – but then I’m particularly fond of hornbeam. You got a lovely garden, those fluted tulips are gorgeous, and now you’ve named them I’ve put them on my shopping list. I’ve seen one of those statues of the bluefish lady by your pond before, they are dotted all around Barnsdale. Thanks. I did not know that Barnsdale had our Elise! Beautiful! I am a flower person, but your lawns are eye catching. Thanks for visiting my garden. I suspect the lawns look bigger on the photos. Your garden is always a joy, but to see it coming into fresh growth and all prepared for the next season is especially nice. I admire how well designed it is with just the right balance of form and space, it makes me a bit self conscious about my own hodgepodge! Thanks. I have been very lucky to have a large garden to play with. Thanks Diana. The curve of tulips is working. As the bed is round it is always tricky without ending up planting in circles! Thanks for visiting our garden. The roses are a bit early. The one at the front of the house is normally first but has yet to flower. Steve, this is an exceptional property. It’s a pleasure and inspiration to take this little tour with you. Thanks for such a wonderful tour of your garden! I am sure May will add more splendor to this piece of Heaven! Thanks Anca. Have been away these last few days so I expect it will all have changed when I get home. A wonderful springtime your, Steve. Simply marvellous hornbeam columns, too! Thanks Kate. The columns are beginning to look good after a very significant pruning a couple of years ago. Magnificent! I love the various places you have for garden viewing. Thanks for the guided tour. I look forward to seeing it through the seasons. Looking fantastic as always, Steve. Lovely to see the roses coming into flower. Can imagine their scent. Went to visit Coton yesterday. Reminded me of your garden. Thanks Karen. been away for a week and half and it has gone mad!